To celebrate our centenary we took part in a number of events, some that we organised locally, some that were national and some that were international. In 1907 on Brownsea Island near Poole, Robert Baden-Powell, a hero at Mafeking in the Boer War, organised a camp for a collection of local boys. One hundred years on there are scouts in every country of the world bar a handful that have expressly forbidden scouting. As well as events to mark the centenary we also added a centenary necker, tied in a friendship knot, onto which four centenary badges could be added: a centenary-camps badge, bring-a-friend for introducing a friend to scouting, scouting-sunrise for joining the dawn event on the actual centenary anniversary day and join-in for taking part in one of the other centenary events like tree planting. We held a special commemorative service at Great St Mary's church in the centre of Cambridge preceded by a picturesque candle-lit procession from 'the backs' through the colleges. 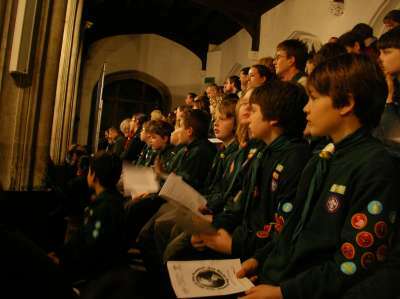 One of the centenary activities was to mark one of our normal Tuesday evening meetings as a bring-a-friend meeting. 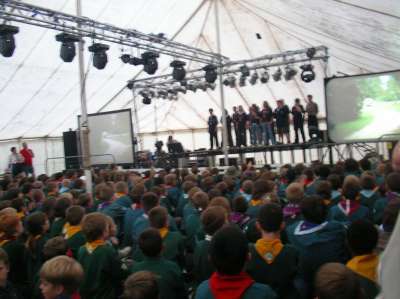 This meant that cubs or scouts could bring along a friend to show them what scouting is all about and maybe give an insight into why scouting has grown into the worldwide movement that it is today. 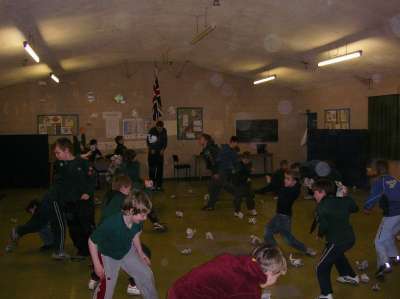 We joined scouts, cubs and beavers from all over the UK under canvas on the same night. As it turned out it was the wettest night of the year! The camp, or jamboree, for the Cambridge district was held at Cherry Hinton Hall and was hence quickly known as Cherry Jam. 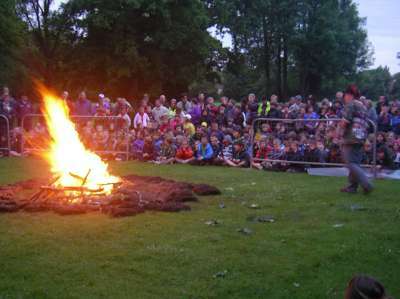 Activities included zip-wires, human-table-football, a disco and a multitude of crafts as well as a huge camp fire lit by our eldest scout. To mark the actual centenary anniversary we held a special event at dawn on the day that, 100 years earlier, the camp began on Brownsea that started scouting, as packs, troups and groups were doing all over the world at dawn where they were. 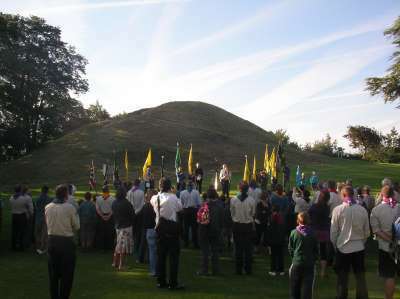 After a few speeches we all rushed to the top of Castle Mound and surveyed Cambridge in the early morning light. 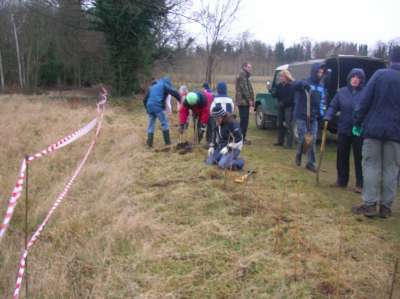 We set out to plant 100 trees at Wandlebury Hill, just south of Cambridge, to mark the centenary. In the end we planted around 280 saplings to form a natural hedge to keep livestock that help graze to maintain the meadows at Wandlebury from escaping into neighbouring farmers' fields. They were predominantly thorn trees but all native to the UK, such as Hawthorn and Blackthorn. It was a cold 'horizontal rain' type day as can be seen from the photo but even so many of the cubs and scouts, and even some beavers, made it to help out.